Automate field service operations to improve efficiency and save money, with possibly the most affordable solution on the market. For managers, the easy-to-use software coordinates all field service operations and customer interactions in a single platform. For field personnel, the free app on their own smartphone is the cure for all their paperwork headaches. Your first 3 users are free forever! Schedule and dispatch assignments for employees or contractors. Advanced features let you delegate to “team leaders.” Get real-time status and location tracking information. Enable strong collaboration between field workers and the back office. 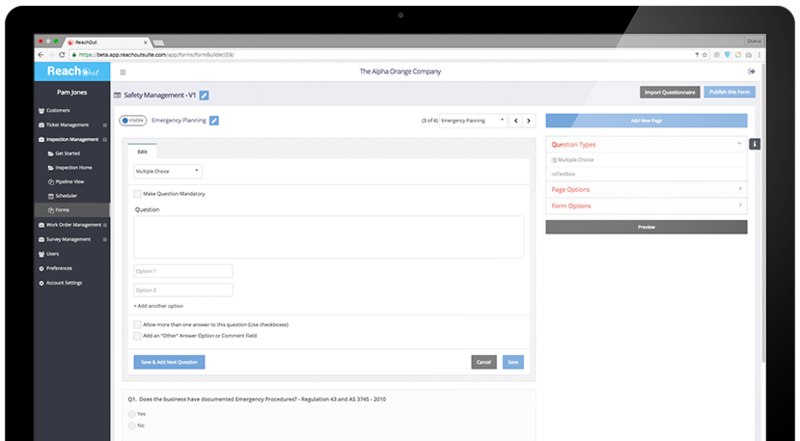 Assign jobs easily with intuitive drag and drop actions – with automatic notifications to the field staff. The graphic display is easy to comprehend and saves time for harried dispatchers while improving the utilization of those in the field. The customer repository holds the history of all the interactions with your clients. A single view allows you to see all your prior activities with the customer and their past purchases. Technicians can instantly pull up the details of the customer they are to meet next. Customers love it when they see you know what’s going on, and your customer facing personnel are more confident when they know more about the customer. Time management is a critical aspect in field service businesses. ReachOut lets you easily track when personnel are, or are not, where they are scheduled to be. 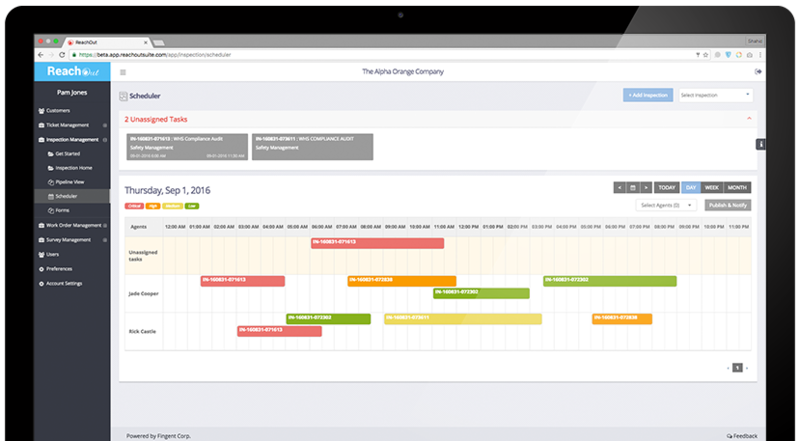 Timekeeping options let you automate timesheets, monitor travel times, and confirm the time taken to complete a job. When last minute schedule changes are needed, managers and technicians have the centralized information needed to make the right choices. Keep the entire process — right from the minute a new job is created to its invoicing — automated and digitized. Create estimates and invoices. Collect customer signatures on your smartphone. Eliminate paperwork in the field and in the office. Forget the pain of managing piles of paperwork associated with each job. Every form is online, organized and quickly accessible, so that all the information you need is readily available at your fingertips, without any hassles. 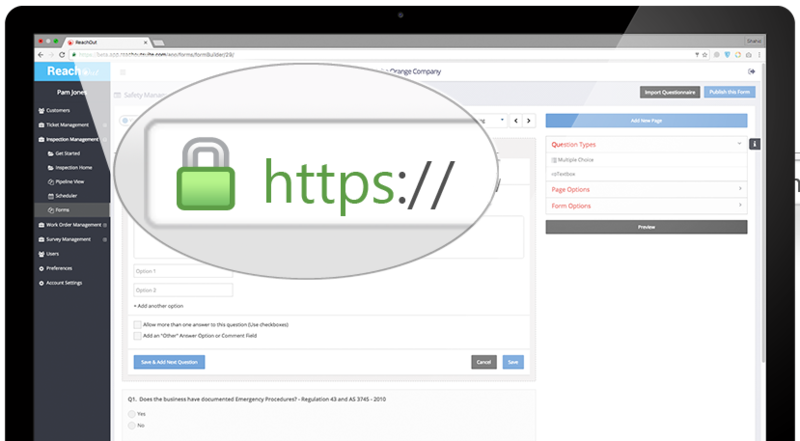 With a single, secure, portal, audit time data collection is easy. Construct customized, re-usable, complex inspections with “smartforms” that guide data collection from a smartphone…with annotated photos. ReachOut’s rich data types and scoring capabilities not only makes it possible to gain actionable insights, but powerful options make the reporting transparent, flexible, and quick. Now you can understand the reason behind every dip or rise in that efficiency curve, and stay ahead in the audit game. Field Service Management Software helps you co-ordinate and manage field operations through a mobile workforce. The software helps you automate tasks like scheduling service orders, dispatching agents, creating invoices and identifying job status. FSM software is powerful in numerous industries, but particularly those that employ mobile agents or contractors. The way this software uses and presents this information can help you improve customer satisfaction, increase operational efficiency and increase employee satisfaction. For organizations and teams using spreadsheet software or paper, a field service management software can be a game-changing piece of business technology. ReachOut is an affordable SaaS-based Field Service Management Software. How can using a Field Service Management Software improve my team's productivity? Field Service Management Software like ReachOut consists of 2 distinct but tightly connected parts- An administrative portal for managers or leads, and the mobile app for technicians or auditors. The seamless transfer of information (forms, instructions, notes, pictures) between these parts eliminate the issues caused by- illegible handwriting, long emails, heavy spreadsheets etc. Technicians can download forms and instructions, and upload results over the internet. This eliminates the need to scan and print or to download forms over USB from Desktop. Software like ReachOut ensures that such online connections are secure and safe. On the administrative portal, ReachOut provides a unified view across your entire team’s activities, supporting you to stay in control of the entire process. Calendars and easy scheduling features help secure efficient team utilization. 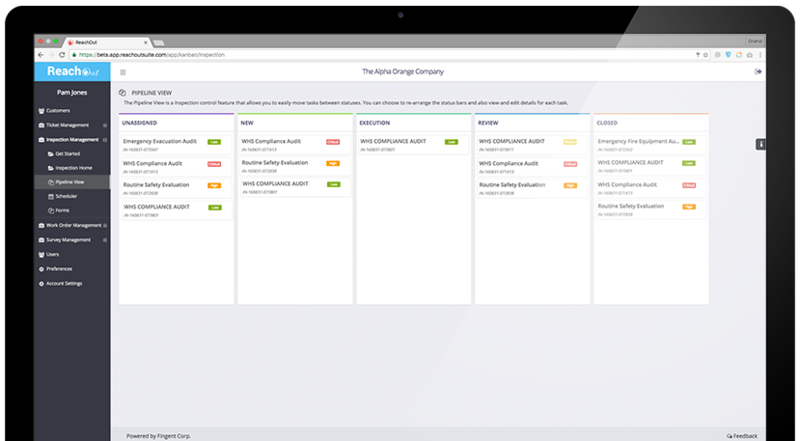 View the entire workflow at a glance, to know the status for all tasks and all customers. Send reports to customers directly. 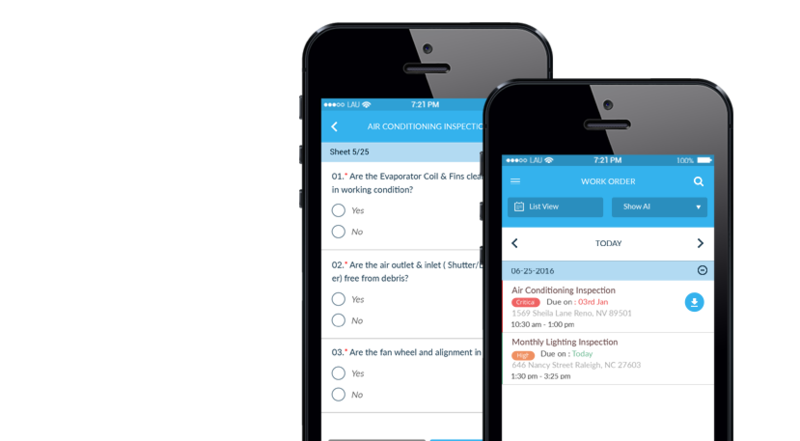 On the mobile app, Technicians can view their schedules and plan ahead. ReachOut manages your photos automatically- Technicians can take pictures, annotate and add these to specific checklist items eliminating the need to reconcile these pictures later..
How can using a Field Service Management Software improve Customer Satisfaction? For a manager, all customer information (Ongoing and recent activities, Sites and locations, schedules and follow up actions, work orders and tickets) is easily accessible in one place. Detailed and actionable reports, with photos and quotes, invoices, etc. can be sent to customers as soon as the job is completed. Eliminating errors and confusion in the work assignment process helps field agents get things done right the first time. Field agents can now work from smartphones avoiding re-entering of data at the office. The time saved by your technicians can now be spent interacting with customers to build long lasting relationships. Overall, customers appreciate the transparency, effectiveness and the quick turnaround enabled by a field service management software, like ReachOut.